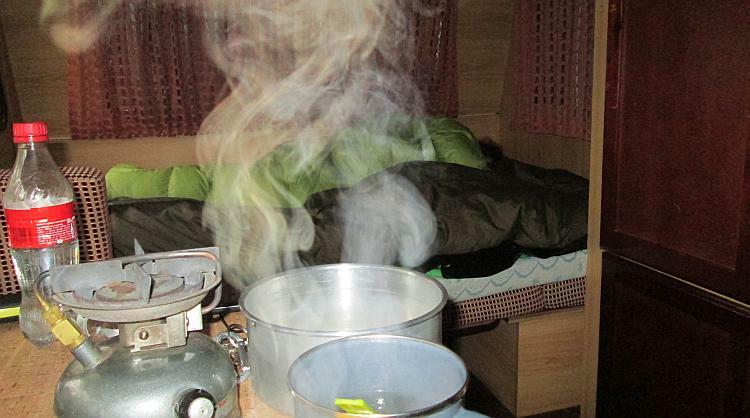 We survive the night in the caravan without issue or harm. In fact once I managed to get over my overzealous imagination I slept well enough. Now we pack up once again. This time we know what to expect as we're going to Camping La Viorna in Potes where we were last week, it's a settling thought. Come on madam - wakey wakey!! Not a chance. How odd. We've come all this way to explore, to see something different from home, to be wild and adventurous (relatively). And here I am looking forward to being somewhere I know what to expect. Static and dynamic qualities (thank you Mr Pirsig). We need things new and fresh in our lives to keep them interesting and engaging. We also need predictable, regular, everyday things to ground us and to reassure us that the night will become day and we will wake once again. Some people like a lot of static qualities, others just need to know there'll be some air to breathe and the rest can be completely random. We are all unique yet the same. Me? I'm probably average. I like my little adventures and I'm also very much a creature of habit. I'm average at many things you know, in fact there is only one thing I excel at and that, dear reader, is being average. If only there was a championship for being average. If only I could get paid for being so...so....so ordinary. I digress. We scuttle off the campsite and back onto the CL626 heading east. This road could could run us straight onto the N621 which taken northbound would run us straight into Potes. However despite how good the N621 is it appears the LE331 and LE333 are even more wiggly and wobbly than the N621. It's time to get a wiggle on. It's patently obvious why I like the idea of returning to Potes as this road writhes it's way up, down, through, over and under these mountains. I'm in the joyous dilemma of needing to slow down to admire the mountains and to press on and make the most of another electrifying corner. There's another lake (or reservoir) bringing the elements or earth, sky, water and tarmac together once again. Fabulous. Excellent. Brilliant. I spot another damn which means this is a reservoir, Embalse Del Porma. I pull in to have a look. In the sun a couple of tiny lizards are basking. Sun, yes sun! There are still clouds above but they're patchy. Water, mountains and roads. It's a hard hard life. The road continues to be a delight. The scenery too. It is a joy, and also somewhat distressing. If you were to take the time to look back through the travel stories (they go back 14 years) you might notice that in the early days I used to get rather homesick. I'm not a natural traveller and being on the road was perhaps a little too dynamic for this little homeboy. Being abroad and away from the safety net of my native country was the hardest part. The Netherlands saw me a little more relaxed and at ease with being abroad. It took a day or two on this trip yet despite a couple of hard days I've been much more at ease with the whole concept of travelling. There's no magic or revelation, I am simply gaining experience and with that comes a little measure of confidence. I am not a natural traveller, I have to grow into it. In such pleasant surroundings it is an easy place to grow into. I have been sufficiently harmonious to enjoy Northern Spain. There has been much to enjoy. There remains another few hours of these roads and mountains and lakes before we reach Potes. 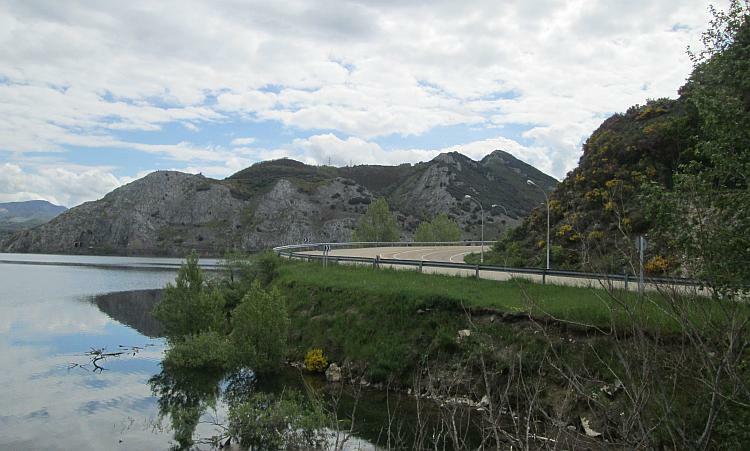 After Potes there'll be a few more kilometres of "good stuff" before we're on the motorway then in the city of Santander. Then a ferry and Britain and reality will once again come crashing in all around me. We turn off the LE331 onto the LE333. The road softens for a while then as we start to climb it requires our attention. I feel the altitude, it feels the same as the Alto Cruz in Sierra De La Demanda did. The road appears on the maps to be a fairly major route however the surface suggests otherwise. It's broken and potholed, gravelly in patches, more akin to a farmtrack. We climb. My bike being quasi (pretend) off road capable is acceptable on this rough surface, I'm watching Sharon though. Her Kwakker is basically a naked sportsbike so it's not ideally setup for this surface. She's fine. I've taken her down enough narrow lanes and questionable surfaces, she knows the score. With popping ears we crest the lane from between trees and rocky outcrops. Oh wow! I had not expected to be crossing another pass but the brown sign informs me we're at 1,625 metres altitude. No wonder my ears were popping. There's an area to park although it's rather off road, I watch Sharon again but she's cool. Puerto De Las Senales at 1625 metres apparently. Ha! Yeah we must be back in the Picos area, a British bike arrives. This couple, 2 up on a Tenere 1200 are hoteling around the area. They've been before, they know what it's all about. I'm warmed to hear despite being here several times previously they still love the place and they're still finding new routes to explore. I've barely touched the surface.There's a handful of peaks and valleys, then I walk a little and the view once hidden behind an outcrop fills my eyes. Having seen some impressive sights I guess I've lost the surprise of the scenery now, oddly though this allows me to enjoy it. I'm relaxing, it's an odd sensation for me. I'm chilled and I'm just breathing it all in. Riaño. We stopped here for petrol at the start of the trip, this time we pass through. As I look to my right I see a smart, pretty town. The water of the reservoir, the mountains and the road we're on all bring to mind the road from Fort William to Mallaig where it runs by the side of Loch Eil after Corpach. It's not the same, but, well, it feels the same. I should have stopped to look around Riaño, dammit. I guess it's a fine excuse to come back one day. What's this?! So far we've enjoyed ideal riding weather, dry but with some cloud to stop the sun from scorching the earth and from making us sweat. There is a big grey mass festering ahead and the air is cooling. Rain. I pull in and we don our waterproofs. As we rise into the hills the rain arrives, more mizzle and drizzle rather than the downpour the clouds suggested. What little rain their was passes as we pass the deer statue. 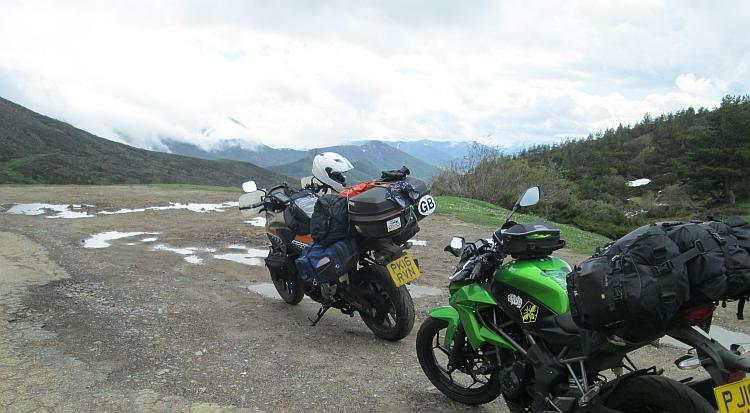 I gingerly attack the grippy though wet tarmac and then as the road eases towards Potes I ease off the throttle and the skies clear. Damn it's going to be as miserable as hell when we get back to Blighty's busy, built up and boring byways. In spite of my ego's desire to be the wild explorer of new places my brain is mightily pleased to know where I'm going. It's so much easier the second time around. After pitching, for the first time in 4 nights, we are pondering what to do for tea. We've been very good. We've cooked or bought affordable meals from the shops and not gone crazy in the cafes. We add up our notes and change. Yeah, we're good on the budget. We walk to the bar restaurant on site. Camping La Viorna, the mist is trying to hide the peaks of The Picos. The food is affordable, similar to what we'd expect to pay back home so we walk in. The youngish chap manning the room is bright, perky, attentive and friendly. I'm sure Spain has its fair share of grumpy and witless people but we seem to be doing very well in avoiding them on this trip at least. I'm happy to report the food is of a good standard and I'm feeling full. While I have no objection to our self catering ways and we've eaten well (too well) it is good to be seated at a real table, eating off real plates and in a solid building. This is most civilised, we engage with a couple of Brits travelling in a campervan as another shower passes over then reveals the stupendous mountains once more. Sharon and I walk around the site, looking out to our surroundings and in to the campervans. We pretend we're wealthy. We'd have one about that size, that one over there, big enough to be comfortable yet not that massive one, that's just ridiculous. We'd have a trailer with bikes on. 125s? 250s? Hmmmm, there's pros and cons. We are dreaming of course but if you don't have a dream?